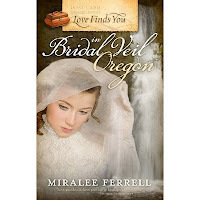 Miralee Ferrell has captured my undying loyalty with her suspenseful plot of intrigue, romance, and redemption in Summerside's Love Finds You in Bridal Veil, Oregon. From its beautiful cover art to its extremely surprising ending, this book drew me right into the Northwest logging town at the turn of the century and into the hearts of her characters. The prologue sets conflict in motion as Margaret Garvey's well-meaning father sabotages her impending marriage to Nathaniel Cooper, making her think Nathaniel has left her without a word. Fast forward four years, and Mr. Garvey is on his deathbed, but expires before he can confess. Enter handsome and faithful Andrew Browning, the young man Mr. Garvey had asked to look after Margaret before he died. Andrew's polite overtures leave Margaret wondering if he is merely fulfilling an obligation to her, or if he feels a personal connection. When Nathaniel comes back to Bridal Veil, she has enough emotions to sort through, but her life is about to become even more complicated with the arrival of a run-away brother and sister, and the coinciding murder of a neighbor. Can she protect these orphans from accusations against them? Will she choose the right man? And will a secret buried in a box for four years tear apart her trust in men? The questions build in intensity as twist after turn kept me riding a logging flume of suspense to find out whodunnit, who wins the girl, and what is to become of the children. The last few pages had the most surprising and redemptive ending I have yet to read in fiction. Ferrell creates a story that will captivate and transport to a story world full of sensory imagery, adventure and emotion and leave the reader with a deeply satisfying message of God's provision. Several examples of children's clothing were displayed at the Chemung County Historical Society's featured exhibit, Fabrics of our Lives, Great Life Moments Through Clothing, 1860-1900. This pair of Amethyst silk taffeta mother-daughter gowns inspired my imagination. Dated from the 1880's, they featured a bustle for the mother's gown, and the mid-calf length of a young girl's frock of approximately ten years of age. The buttons of these gowns resembled a cluster of tiny beads, rather like orange raspberries. Here, a lad's navy blue zouave suit is pictured, modeled after the French zouave military uniforms of the era. Circa 1860's. It is of wool, and the black embroidery was almost mint condition. A handsome figure this little suit must have cut! This Little Lord Fauntelroy-styled suit in dark green velvet reflects a style that enjoyed great popularity after the famed novel character. Note the eyelet lace cuffs, and the inset photo of the original owner of the suit. Boys' and girls' clothing was not differentiated until the age of three or four years, during which both wore white gowns. A boy was considered "breeched" once he had his first set of pants. This pair of girl's dresses were owned and worn by Samuel Clemens' (aka Mark Twain) nieces. Clemens married an Elmira girl named Olivia, daughter of the notable Jervis Langdon family. These gowns date from the 1880's. The scarlet red silk gown boasts a print robe with a long train, and silk ribbons in startlingly pristine condition. This was my favorite article of clothing in the entire exhibit. A small girl's dress and white cotton pinafore are shown here. The simplicity of the stitching and lack of embellishment indicate this little cotton frock was owned and worn by the child of a working class family, likely aged four to five years. From the 1860's. Chemung County Historical society in Elmira, NY currently features an exhibit of Victorian clothing called Fabrics of our Lives, Great Life Moments through Clothing, 1860-1900. Yesterday I had the pleasure of viewing the many dresses, suits and childrens' frocks with my husband, who took some delightful pictures. These two gowns appear in a center display depicting the changing hours of a woman's wardrobe, from a morning dress to the two evening gowns seen here. The first is a golden yellow silk brocade from the 1890's, meant for wearing from 10pm to midnight. The second one is a creamy gold silk taffeta and brocade gown, circa 1880's, meant to be worn from 8pm to 10 pm. Following is a rear view of this same exquisite piece. The fine quality of the color and condition in which these dresses remained amazed me. And the utterly petite figure a Victorian woman must have had also made me marvel. These are small gowns, with shoulder widths more like a child's than the average modern woman's. Also noted were the layers of underpinnings beneath these dresses. From chemise, to petticoats to bustles or hoops, a Victorian woman wore a full twenty pounds of clothing on average. The dark brown piece seen here is a late morning walking dress, meant for wearing out of the home for calling on friends or a trip to the post office or for running any miscellaneous errands. Note its longer sleeves and higher neckline. This would have been worn after 10 am up through the noon hour. I imagine with its tailored jacket it would have been meant for cooler weather. It strikes a somewhat formal image. Next, this afternoon tea dress begins to relax the neckline and was meant for entertaining friends at home. This would be worn from one until four in the afternoon. Again, the fine condition of this fragile silk material was impeccable, and the colors of the chocolate and red medallions over the pale background just popped. It lacks some of the ornamentation of other gowns, and was displayed without bustle. Finally, this last dress pictured is a most basic frock, a morning dress in which a working class wife would perform her household chores. Even the more well-to-do wore morning dresses as they prepared for the day. This would be worn from 8am until 10am. This is part one of my series on Victorian clothing, covering the changes in a Victorian woman's apparel. A well-to-do woman of this age could change clothes up to six times in a typical day. Middle class women tried to emulate wealth with lavish styles, but the truly wealthy distinguished themselves by clothing with more ornamentation and finer fabric. Next post, we'll view the childrens' clothing collection. This letter is my personal favorite, as Private Personius describes an incident with the cook and some unruly artillery soldiers. The period humor and spirit really shines through here. Enjoy! This is an exact transcript from a handwritten letter that my son and I transcribed from our local historical society. Misspellings and grammar remain true to the original text. I particularly enjoyed Charles Personius's telling of the events concerning Fredericksburg. The period voice of these boys has long enchanted me. New York State history would not be complete without discussing the five tribes of the Iroquois. In my particular area of New York, which is the Southern Tier—direct center along the PA border —lived the Seneca, Cayuga and Onondaga. Further east lays the land of the Oneida and the Mohawk. The Tuscarora joined the Iroquois League after 1580, when the original Haudenosaunee, or “people of the long house” joined forces and created their Great Council, bonding the people in peace and trade. Hiawatha and Deganawidah are credited for this vision of “Great Peace” between the tribes, calling for burial of their weapons beneath the Tree of Peace. Artifact-collecting with friend and archeologist, Mary Gledhill, has unearthed some exciting finds. She has taught me how to spot a metadi, or grind stone, with its bowl-shaped indentation into the surface. Sometimes you can still see the score marks or striations where the rock was chipped and shaped. Also uncovered in our searches have been some nice little paint pots, where the colors are sometimes still visible in the stone. Mary’s personal collection boasts some beautiful fossils in addition to her metadis, paint pots, and clay pottery shards. A visit to SRAC, or Susquehanna River Archeological Center in Waverly, New York was one highlight of 2009 for me. The kids and I viewed rooms full of locally gathered points, axes, grind stones, pestles, clay pots, corn grinders, stone sinkers used to weigh down fishing nets, plus a visit from authentic Native American dancers. Native clothing, stone animal carvings, and non-New York arrowheads and points also can be viewed here. Mary lives near the site of an ancient trading post, where the Chemung River meets the Susquehanna. She has shared with me her years of study, including native flora and fauna and what they meant to the indigenous people. The Iroquois lived on the land, hunting and gathering as well as farming. Deer, bear, elk (now unknown in these parts), rabbit, and beaver provided food and clothing. Fishing abounded among the abundant lakes, rivers and streams, and settlements of longhouses typically gathered beside these sources of water, transportation and food. Birch-bark canoes were a chief form of travel, and birch-bark containers gathered tree sap for syrup and tree gum to resin the canoes. The Iroquois held great reverence to the Great Spirit, and offered thanks to the animals used for food and clothing. At harvest time, the Great Spirit was thanked in much the same way we observe Thanksgiving. The Rabbit Dance is an example of the Iroquois tradition of reverencing nature. Wampum—colorful beads made from shells—were woven into belts and hung on strings. These served many purposes: as currency, peace offerings, wedding gifts, and in ceremonies. Turtle shell rattles, skin drums, and corn husk dolls are among the crafts made by the Haudenosaunee. Tanned deer hides were sewn with sinew thread and bone needles into leggings and shirts by Iroquois women. Bone awls poked fine holes between pieces of birch bark and these pieces were then sewn together for the hull of their canoes. The women farmed crops such as squash, maize and beans, “the three sisters”. They utilized their cleared land in ingeniously conservative ways: The tall maize provided the bean stalk support, while the squash vines trailed over the ground between the climbing vines. Women enjoyed a position of power among the council. Although the members of the Great Council were warrior men, it was the older women of the tribes who appointed them and removed them from their positions. In the Revolutionary War, Continental Army General Sullivan staged his campaign against the Iroquois in a bloody annihilation. Sullivan made encampments in Elmira, along the northeast bank of the Chemung River. Further to the east, in Lowman, NY, a federal park memorializes the slaughter at Newtown Battlefield. The park stands on a deceptively peaceful bluff overlooking the beautiful blue-green hills framing Chemung Valley. Living history events take place at Sullivan’s Monument annually. The third book in the Charles Town Bell series, The Raven Saint brings all of the Caribbean sea-faring adventure that we’ve come to expect from these romances, combined with the superb writing of a master phrase-ologist, plus characters with all the chemistry of an Estee Lauder perfume factory. Grace is the God-fearing daughter of Admiral Westcott, the charitable one, the pious one. She finds herself aboard a mercenary’s vessel, where a rogue Frenchman, Captain Rafe Dubois, has kidnapped her and intends to sell her into white slavery in Colombia. The Captain has his reasons for such an atrocious act; he seeks revenge against Admiral Westcott, and intends to use the money she would bring for the benefit of charity. A conflicted man with father-issues and a heart that has been broken by the woman he once loved, he has disavowed any religious faith. Until the divine Miss Westcott exerts her subtle influence on him. Surprises and subterfuge abound. The plot is unpredictable, riveting and fast-paced, and even as things seem to resolve in the final few chapters, the revelations continue. Each character furthers the message of redemption and grace in a unique way that intertwines as each has a lesson to learn of God’s redemptive power, including the pious Miss Grace. Very well-crafted book.